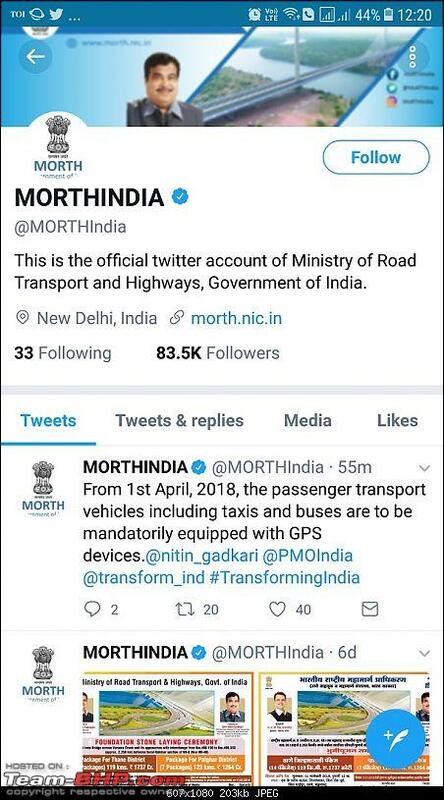 "The Indian Ministry of Road Transport and Highways (MoRTH), on its Twitter Handle, announced that from April 1, 2018 all passenger transport vehicles will be needed to have a GPS device. In a move that can be seen as a way to improve safety for individuals who utilise passenger transport vehicles, the road transport ministry has announced that every passenger transport vehicle including taxis and buses will need to mandatorily equip a GPS tracking device." Last edited by SJM1214 : 17th January 2018 at 12:38. Reason: Minor Change. Good move, though rather than just the installation, its implementation matters as well. What about uniformity as well as getting it installed from a particular vendor? The government should not have any restrictions on this, as the GPS one wants could be cheaper and/or better than the one specified by them. Eg - NMMT has GPS installed in most of their buses which can be seen on an app. This helps avoiding the unnecessary waiting at bus stops and less chance of missing a bus. The Downside - earlier my AC bus used to take flyovers and skip couple of bus stops where no one got in. But thanks to GPS, the driver says that he cannot deviate the route as his supervisors come to know of the exact lane he was in. I am confused about the meaning of passenger transport vehicles. Are personal cars considered as passengers transport vehicles? Or MORTHS meant to say "Public Transport Vehicles" and wrongly used "Passengers Transport Vehicles" term. This news(DEC2016) from "hindustantimes.com" specifically talks about Public Transport Vehicles. Last edited by SJM1214 : 17th January 2018 at 13:48. Reason: Minor Change. GPS, panic button mandatory for vehicle registration: RTO. 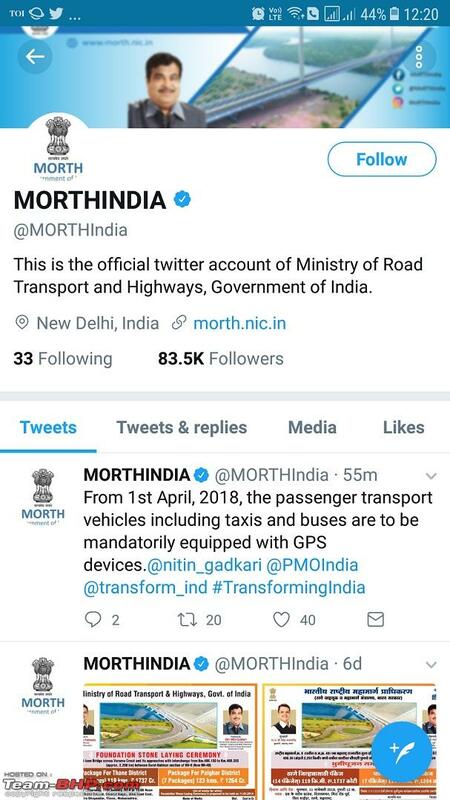 The move comes after the Union Ministry of Road, Transport and Highways (MORTH) had instructed RTOs across the country to ensure installation of these two devices in every commercial vehicle, excluding autorickshaws, e-rickshaws and commercial two-wheelers. Published: April 9, 2018, 4:53:35 am: The ministry notification had stated that the systems will help improve safety and security of commuters. There are around 2 lakh commercial vehicles in the city, which need to be fitted with the system. The device and its installation would cost around Rs 10,000-12,000. A monthly fee ranging from Rs 100 to 400 would also be levied. However, the city traffic police have denied receiving any notification or letter from the Union ministry. “There are no clear directives. The ministry has just asked us to implement the notification in December. We are seeking clarity from the MORTH and the transport commissioner’s office. We have not received any communication from the ministry yet,” said an RTO official. Meanwhile, luxury bus operators’ association has opposed the notification, citing confusion regarding the directives. A member of the association said the move will add to the burden of bus operators. He added that before implementing the directive, the RTO should convey the message clearly, as many buses were yet to pass the fitness test. One more headache. First the speed governors and now this. These are half-baked idea that are easily defeated by Indian jugaad. While GPS was still OK, panic button? Here is the homepage of the Autocop GPS tracking portal. Looks like the company has already come up with a product that meets the MORTH guidelines. The implementation of the same has been deferred till April 2019. GPS trackers, emergency buttons in public service vehicles soon! 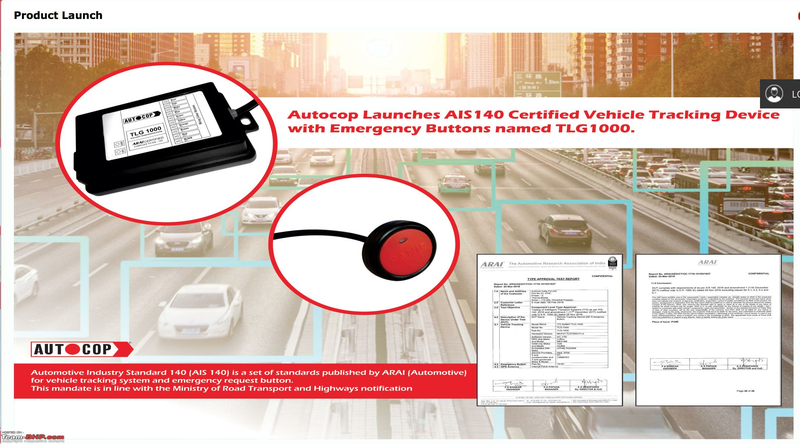 The Ministry of Road Transport and Highways issued a notification in 2016 mandating the provision of a vehicle location tracking device and one or more emergency buttons. 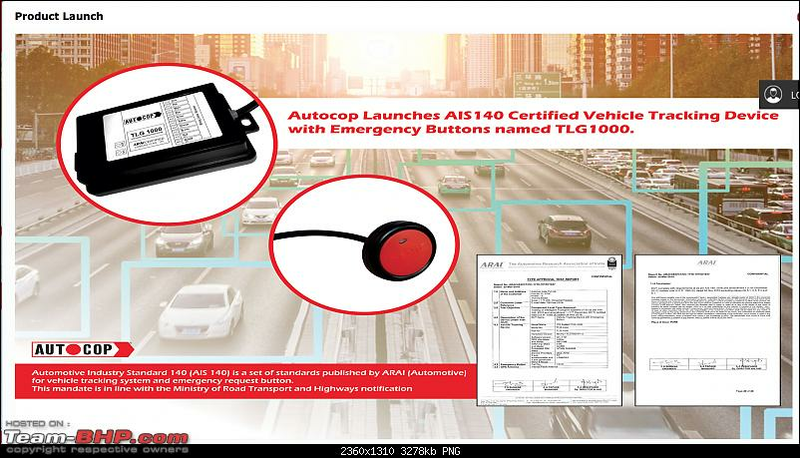 The GPS tracking device and emergency buttons were to be installed from April 1, 2018 onwards in public service vehicles except for two-wheelers, E-rickshaw, three wheelers and any transport vehicles for which permit is not required under the Motor Vehicle Act, 1988. Related news from various states. Pune : Panic button check sees ‘ritual’ rollout. Confusion over GPS rule hits taxi registrations. While Aero India 2019 has pushed up the demand for cabs, particularly luxury ones, registration of new taxis in the city appears to have taken a hit. Cabbies say vehicles aren’t being registered, citing lack of vehicle location tracking and emergency buttons. Taxi unions say the transport department is ill-equipped to implement the rule and there are only a few recognised vendors selling these devices which are charging over Rs 10,000. Current implementation choke points not withstanding this is a great example of technology being used to improve safety for women and reduce fraud. We should implement this across India for all motorized passenger carrying vehicles.